Leapin' Lizards! Here are 83 of our finest reproducible pictorial scenes and short descriptive stories, plus 83 corresponding activity sheets! 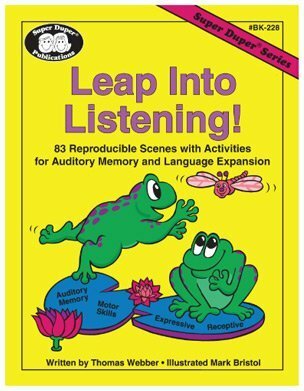 Activities include over 1,500 questions/exercises for auditory memory, receptive listening, language expansion, and motor skills improvement. Your students will enjoy hearing about Ms. Fix It, Tappin' Tommy, Detective Don and all the other characters in this 167-page book. Perfect-bound. Softcover.